The saw for the professional manufacturer. Ergonomically designed for ease of use and built for longevity. 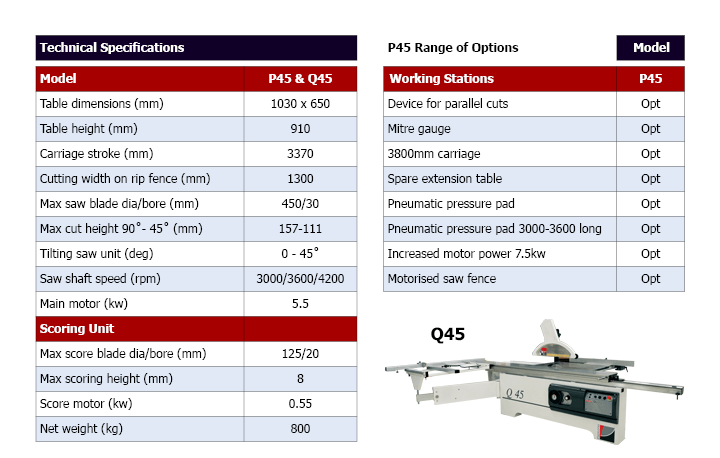 The 3200mm long table offers an outstanding 3350mm cut length and the ability to change blades with the carriage at either end of the stroke. With a 450mm blade the saw has a maximum depth of cut of 155mm without removing the scriber, coupled with a powerful 7.5HP motor the machine is man enough for even the toughest of jobs. Motorised rise and fall, pre-set mitre angles and a carriage that locks in any position make the machine a real pleasure to use.